Homer Gallegos, Commander of the VFW Post 8788, presents Clemente Vasquez with a U.S. Flag at the burial services of Donald Kent Friday May 5, 2017 at the Rio Grande Valley State Veterans Cemetery in Mission. Vasquez described himself as a friend of Kent and helped get his remains placed in the veterans cemetery. 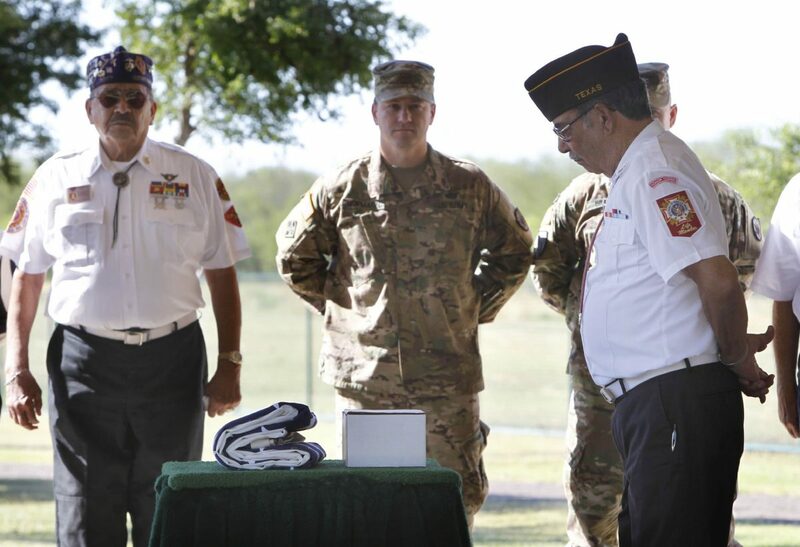 MISSION — A military veteran who died two years ago finally received a fitting burial Friday at the Rio Grande Valley State Veterans Cemetery. With an American flag standing at half-staff against the sunny skies, several veterans from other military divisions lent a hand Friday morning as Air Force veteran Donald G. Kent was laid to rest with military honors two years after his cremation. Xochitl Hinojosa and her family knew Kent and decided to give him a proper burial after learning that his remains were unclaimed and still sitting in a funeral home. “Mr. Donald Kent was a great friend to my love (husband),” Hinojosa stated this week in a Facebook post. Israel Martinez, right, of the Veterans of Foreign Wars Post 8788 honor guard, stands over the cremated remains of Donald Kent during his burial services Friday May 5, 2017, at the Rio Grande Valley State Veterans Cemetery in Mission. Kent died in February of 2015, but his remains were not claimed by any family member. Kent served in the U.S. Air Force from 1950-54, with help from his friends the cemetery buried him will full military honors. 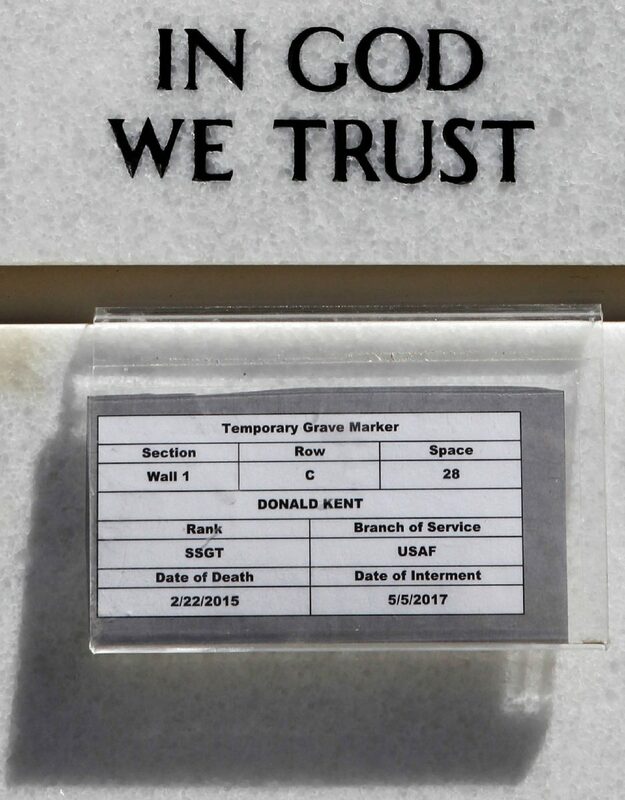 A temporary marker hangs over the front of Donald Kent's spot in the mausoleum Friday, May 5, 2017, at the Rio Grande Valley State Veterans Cemetery in Mission. 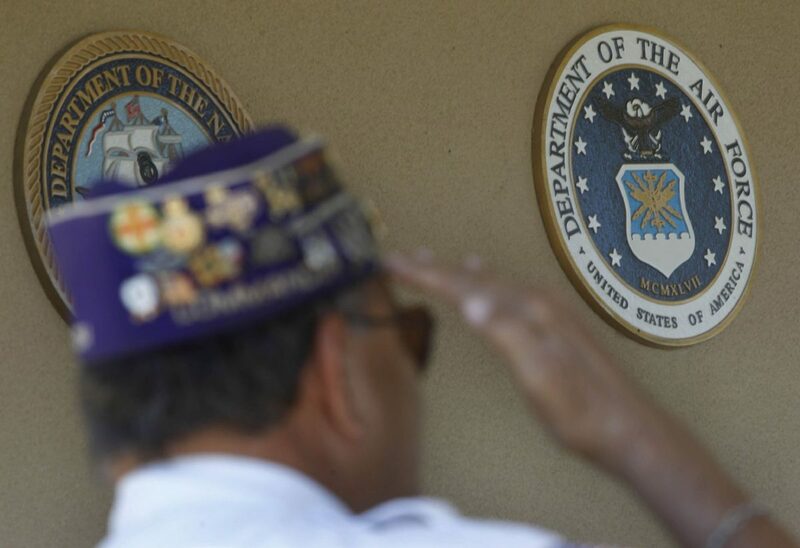 The U.S. Air Force seal is seen on the wall during the services for Donald Kent on Friday May 5, 2017 at the Rio Grande Valley State Veterans Cemetery in Mission. Kent died in February 2015 at McAllen Medical Center at the age of 84. He made his home at La Quinta Inn on South 10th Street for about four years before he fell ill.
“We visited him in the hospital to keep him company since he and my (husband) were good friends,” Hinojosa added in the post. At the time of his death, the veteran didn’t have family or next of kin, so there was no one to see that he received a proper burial. 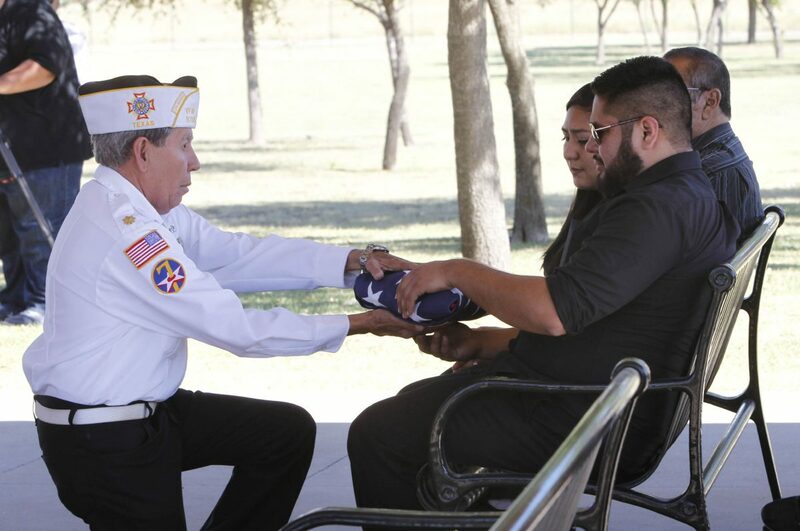 Mary Hernandez, Rio Grande Valley State Veterans Cemetery director, said that because Kent was an unaccompanied veteran it took some time to get his status as a veteran verified in order to be buried at the cemetery. Kent served in the Air Force from September 1950 to September 1954, according to Texas General Land Office. Kent was honored Friday as defender of freedom. Homer Gallegos, post commander for the Veterans of Foreign Wars Post 8788 in McAllen, was one of the many volunteers who attended the burial ceremony, saying that even though Kent didn’t have a family, he wasn’t alone. The ceremony included a 21-gun salute, a playing of TAPS, the bugle call for fallen heroes, and the symbolic folding of the U.S. flag.